Among her other accomplishments, Jackie Berrien helped launch the movement against prison gerrymandering. Last month, Jacqueline Berrien passed away at the age of 53. The NAACP LDF has an excellent essay about her life and work with lots of links to other remembrances of this important civil rights leader, but I wanted to add one more. Before Jackie was Chair of the United States Equal Employment Opportunity Commission, she was a litigator for the NAACP Legal Defense and Education Fund. While there, she took a 3-year break from the LDF to work as a Program Officer for the Ford Foundation where she helped launch the movement against prison gerrymandering. In late 2002 and early 2003, when the term “prison gerrymandering” did not yet exist and most politically savvy people had not even considered the implications of how the Census Bureau counted incarcerated people, Jackie was paying very close attention. In October 2002, Jackie was moderating a plenary session at a large conference in Washington D.C. about felony disenfranchisement. When a panelist did not know how to respond to an audience member asking a question about the political effects of the Census Bureau’s prison counts, Jackie interjected to say that she understood that there was a new report about this problem and that its author, Peter Wagner, had signed into the conference. She invited me to stand up and introduce myself to the attendees. Many of the connections made at that conference formed the core of our work for many years to come. How could an urban-dominated movement have any chance of success at getting incarcerated people counted at home if the political party that is associated with rural America currently controls all three branches of government? The answer, of course, and the foundation for the important group discussion that followed was that it shouldn’t be an urban dominated movement. In fact, as my research showed, rural people had already been hard at work for years trying to address the problem of prison gerrymandering. Telling the stories of places like Essex County New York, and Anamosa Iowa soon became the key link in our rural and urban coalition that has won so many victories. That June, Jackie funded a Brennan Center for Justice-organized convening of criminal justice advocates, civil rights leaders, and redistricting experts to hear the preliminary research results that Eric Lotke and I were having in our respective Soros Justice Fellowships on this topic and to decide on a collective course of action. This meeting set in motion all of the work and victories that followed. 2015 saw the passing of Bertha Finn, one of the unsung heros of the movement to end prison gerrymandering. She was from Anamosa Iowa. Peter Wagner be in NYC to speak about prison-based gerrymandering on Saturday at Columbia University. 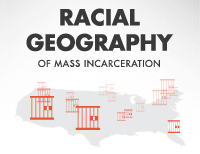 Manning Marable helped put prison-based gerrymandering on the map.